In the past, when we have changed our processing services, what we really changed was some combination of the price and the length of time it took to get the cards on the site. We have tuned those two variables several times over the years as we’ve grown and have always tried to strike the right balance. What has never changed, however, was the way we did the work. For years, no matter the price point or the deadline, we’ve done the identification and scanning processes more or less the same way – one order at a time, and uploading all the cards once the entire order is done. While our new Premium and Basic processing services may appear to be another tuning of rates and timelines, they are actually completely different from this old model. The Premium service is significantly streamlined and much more scalable. It is now possible for some cards to be live on the site within a few hours of arriving. We expect most items to be done the day after they arrive, but it might take up to 3 business days if we get slammed. Previously it was virtually impossible for us to finish all of our steps the same day an item arrived. Now, all processing is done ASAP, and items are handed from one department directly to the next. We can even have many different people working at the same time on the same batch if necessary. Once all of the steps have been completed on all of the items in the Premium batch, the items are automatically uploaded into your account. This used to require someone to review the fees and confirm completion. Now, Premium batches are generally small enough that the computer can safely determine if all stages have been completed, and your items no longer have to wait for extra human steps. You can expect to see Premium items going live Monday through Friday. Occasionally some may also go live on the weekends, but don’t count on it. The Basic service has been revamped and re-engineered even more than the Premium service. Instead of doing entire orders one-by-one like in the past, we have developed a new method to work with like items in batches. In practice, we expect to focus different members of the team on different types of items each week. Every week we will process items from the current year and items that are in season, as well as other items that tend to be hot. Items that are out of season and that might not be super hot will only be processed every two to three weeks. Most of the processing will be done Monday through Thursday. On Fridays we will review our work, and as soon as we have signed off on the items, the computer will automatically upload the partial batch to the website. Once we get near the 8 week mark, we will clean up any remaining items and confirm that the correct fees are charged. Our goal is to have an average per-card processing time of less than 4 weeks. This past Friday and Saturday we finished our first Basic upload, giving more than 100 sellers items to price. We have already completed more than 50% of the Basic items people have submitted. The new system gives us the flexibility to assess the overall incoming volume and be sensitive to the current demands of the buying market. The increased efficiency gives us time to focus additional efforts on the quality of the data that we associate with the images. In order to encourage items to be submitted in quantities we can deal with more efficiently, the Basic service does have a $25 minimum. You are free to send in fewer than 100 cards for the Basic service, but it is best to submit at least 100 items per batch. As of February 1st, all Mailbox items are $1 each and will be processed with our Premium service. If you send any of the above items in a batch for Basic service, they will be separated out and processed with our Premium service. To make life easier on our Processing Team, we would appreciate you separately grouping any of the above items from the Basic service items within your submission. We appreciate all your great feedback and constructive suggestions so far. We are working hard behind the scenes to get a host of new features launched, so please keep your eyes on our blog and subscribe so we can keep you in the loop! ← Did someone say “Championship Parade”? I really appreciate these kinds of updates. It provides transparency, proactively, which I believe serves to further advance the trust and respect of COMC users (and proponents). Thanks! I have a number of cards that I want to send in that are 4.5 x 2.5 and 5 x 3.5, along with some coins that may not have a sell price that allow us to be profitable. Can you tell me at what size things are officially considered oversized? these are modern cards. Regardless of the dimensions, the card must ALSO not be thicker than 1/10th of an inch, which as a rule of thumb we tend to consider anything that can fit comforatbly into a 130pt toploader or thinner. These dimension requirements apply to cards only; sports coins, poker chips, bottle caps, etc must be processed with the Premium service. Thanks for the update. Can you talk to continued advertisement practices? It appears COMC no longer advertises in Beckett? Was this part of the agreement during the dissolution. Thx! Great question. I have been doing my own advertising on blogs, forums, etc. I think spots on local sports talk radio shows would be a great way to increase traffic of casual collectors and sports fans. They were independent agreements. We have simply not pursued the option and they haven’t tried to sell us on more advertising. Thanks Tim, how are you currently advertising COMC if not using a mainstream source like Beckett? If not advertising, is it a temp hold as your team finishes current projects? Thank you. Does this mean that we will see coins on the site soon? I have a couple of them in beta processing to try it out. Thanks for the update, I can’t wait to see a coin market develop here on COMC. There’s no schedule for coins right now; we’re putting all our energy towards cards and creating our own card data for the website. Coins are on the horizon, but there is no ETA. Can you please confirm or deny that the basic/premium setup is still temporary until more workers are available for processing (ostensibly after the catalog has progressed to a certain point)? Basic and Premium are not temporary, but the lack of some other options such as one week is likely temporary. Thanks for the update. 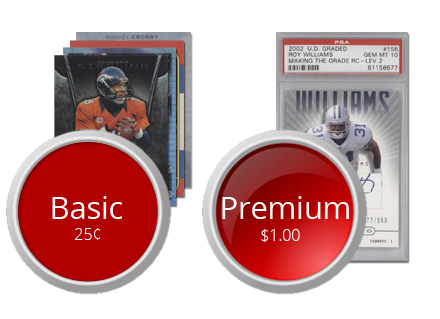 One question: Cards that we send in with the intent to be graded, do we now have to pay $1 processing on those? Or can we bring back the “To Be Graded” option? Or at the very least send the cards in with a note and not be charged? For now you can use either the Premium of Basic and then submit for grading. We will consider more options for processing or adjusting our fees once we have more time. Thanks Tim. I would just send them to Beckett myself but to dumb to fill out the paperwork. lol I liked the to be graded option you guys had. Could just send them in with my other lots it worked out well. Hope its back soon. Thank you for the info though. Good Day. Thank you for an informative post. It justifies the always tough-to-swallow pricing modifications. When the two services were recently unveiled on this blog, I questioned the $1 fee to submit cards priced at $50-plus. However, a few days later I was the beneficiary of an amazing 10-hour turnaround. It was absolutely terrific. Steve Hollander from your staff also provided another fact I hadn’t read or heard before: Your business model doesn’t want processing to be profitable. The goal is to recover hard costs at a zero margin. Although I don’t like paying, it’s admirable comc’s visionaries only want to make money when I record a successful transaction. I’m a huge fan of this site and want you to stay fiscally sound. I want the entire team to charge ahead. Don’t stop improving — at least until I run out of cards to submit. Hi, so we can submit coins now using the premium service and they will be processed in 1-3 days? And, yes – those would be subject to the Premium service. We’re not accepting currency coins right now, that is on the back-burner for the time being. What about redemption cards? Any changes? We’re still handling redemption cards; right now, if you send in a card you want redeemed by us, wait until it’s deposited into your account. From the inventory manager, choose “Submit for grading.” From the grading menu, choose “COMC Condition Review” and when the grading team sees the redemption card, they’ll send it to the redemption team and they’ll handle it from there. (I hope you can determine what I am asking……AGE! That is correct Ken. I have been using the new models and they work great. If you send them sorted in groups of the same type & year it is even faster. One more thought – Tim, you should offer your services to Beckett, when you get some breathing time, to get their website to work as user friendly and fast as COMC.com…..great job on a daunting challenge. I’ll be sending another 1,000 cards in the coming week, COMC! Thank you for keeping the processing rate transparent! Hi, the status percentage reports aren’t very accurate right now, as they’re geared towards the old processing systems, when we processed a batch in it’s entirety. The way we are processing cards now, sorting your cards and depositing your cards in smaller batches, usually on Fridays – these percentages don’t accurately reflect just where your transaction is, in relation to being complete. This is a known issue, and we’re working on updating the software that calculates the progression. Thanks for your patience. I’m still so confused by this. I’ve had a batch of 97 cards with you guys for 4 weeks now and not one card has been uploaded to my port. I thought the idea was to have some go up sooner than later, but I haven’t seen any changes to that. So far I feel this is a huge failure if that was the goal. Why is it taking so long? What kind of stuff did you send in? Some inserts, GU and Autos. Most 2013 stuff. Hi, Thanks for your patience, we’re sorry it took so long to reply; we’ve been looking into this and as soon as we get an answer, we’ll let you know. You’re correct in that it shouldn’t be taking this long, and we’ll get this cleared up. Moe any update for us on this? I’m now back down to 29% from 35% and still not one card uploaded in over 4 weeks. I’ve sent out another email to the processing team, as I’m shaking the trees to see if I can get an update. As soon as I hear anything, I’ll let you know. Addition: 3:18pm. Ok, I have some info on this – because your transaction is all football, it’s been given a lower priority, since we’re no longer in Football season. The team is focusing on basketball and hockey, as those seasons are currently running. But, since it’s a smaller order (under 100) there’s no reason why it should be taking this long, anyways. If you wish, please contact us and we can put you in touch with Steve Hollander, our Senior Account Manager, to discuss this further. Thanks! Thats a joke Moe. Football has become low priority? There are some good cards in there that would sell right away, and thats considered low priority??? I’m sorry but I will not be sending in anymore cards until COMC can figure all of this out. 4 weeks and 2 days and still not one card has been uploaded. As a business I would think you guys would want to get all cards uploaded as fast as possible to increase sales. Just because its Hockey/Basketball season doesn’t mean football/baseball and other sports aren’t better. I’d love to see stats that prove me wrong if I am. But I think thats a completely flawed system and is upsetting sellers like myself. I’ll sell what I have on the site and move on. Thanks. Checking my sales since the Super Bowl I have been selling mostly football and baseball. I have a very good selection of all sports I believe. What this new ‘change’ appears to be some person or persons deciding what is hot and what is not. In my 30 years of buying/selling/grading, unless you have a crystal ball, by the time ‘what is hot’ reaches the marketplace, like the stock market, most of the best buying has been done. Let the sellers determine what and when the items will be presented to the buying public! So rather than try to tune something too much without a decent history for proper direction so often, let’s stop and think what is best for the sellers. What I am suggesting will eliminate any worry about employees, who have accounts on this site, doing the deciding what is hot and essentially directing some folks what to buy in some cases. My suggestion: When sending cards or any collectible to be added to the site, sellers will have up to three “priority” batches for one shipment or parcel if they choose. (1st, 2nd or 3rd post) That way the seller will determine what is hot and will be his/her responsibility for what is hot or not. This will help processing faster because the seller, to benefit both himself and COMC, would sort the items somewhat. If all sellers would put some effort into some kind of sort order, rather than just throw a bunch of cards in a box and send them along, the processing would benefit all involved. A simple strip of paper with “1st, 2nd or 3rd post” on it dividing the groups is all that is needed if a grouping is desired. I think that’s a great suggestion! I think it would make more sense to look at what buyers are searching for, in order to determine what to process first. And I suspect that is what they are doing. I think COMC is more likely to do what is better for the long-term health of the organization, rather than helping its employees get its 50-cent cards posted on the site sooner. This isn’t some two-bit operation anymore. Moe alone probably brings four bits to the table. I’ve been asking for proof for over a year now one stats of what sells. COMC should post to its sellers whats selling so that we can see whats going on. Remember, the sellers and buyers make the site. Without us, the site goes down. I want to help the site for my own benefit of course. Have you seen any stats? I’m positive that Football and Baseball sell at a much greater rate than Hockey or Basketball even during their off seasons. Just look at the number of cards in each sport on the site: Baseball outnumbers hockey and basketball 4 to 1 with football 3 to 1. I’ve been in the collecting business now long enough to know this. They are the two hottest sports regardless. It is starting to look like a two-but operation now with so many changes that are happening when they can’t even finish one they started (Coins & Banknotes and Memorabilia). Id also love to see the stats on the Magazines to see if its actually worth the work they put into that. Comics I can understand, but not magazines. Joel I understand you have a lot of stake here and want to remain on their good side because your an overall top seller and consignor, but you have to admit, this wasn’t a great idea as it stands right now. If it’s going to upset sellers (And most of us only sell baseball and football as seen by the stats I just mentioned above) what was the point other than to make up for their lack of ability to handle the large number of cards coming to their company? It’s a smoke screen to allow them to get the cards loaded in 8 weeks rather than 4 weeks. I’m not trying to be that guy, but I have to stand up for what I feel will make this site better. Taking 8 weeks to list football cards isn’t going to help the site. Go sell on ebay or build your own site. You provide nothing to this site. You can keep stats on what people are searching for on your site and historical data. I could care less how long you have been “in the business”. You are old, don’t understand technology, and change scares you. go away. You probably think Arod is clean too. Ok fellas let’s settle down here! I’m just an innocent bystander and got hit with an “old” comment. I’m old, don’t understand technology but nothing scares me anymore. But to see this blog going south with unnecessary and personal attacks doesn’t do any of us any good. So heed some wisdom from this old goat and be nice! Thanks. PS/ I understand Arod showers regularly. stop complaining and wasting their time. I can’t believe they even respond to this non-sense. Ive had ~250 cards there for almost 6 weeks. Still nothing added as well. We’re really sorry about the delays; Tim’s made some modifications to the processing priority system, and things will be speeding up – in regards to getting cards deposited into users’ accounts. Mine finally got added today. 22 of mine were Hockey/BBall cards. They took 5 weeks to be added with the others. Clearly the “Priority” strategy is a complete failure and they need to get rid of that. I hope yours make it onto the site soon! First of all who said anything about 50 cent cards and helping employees??? Strange to put the emphasis on that. My mention of employees was a hint to a business that I want to succeed and eliminate any doubt about inside funny business. It happens all the time by the way if you haven’t noticed since this “hobby” took flight in 1978. So my helpful hint should not have raised the hairs on anyone’s neck unless they are naive or know something. I think the naive fits here. Now to the point of “……look at what buyers are searching for…” – just how in the world to you suppose that can be done??? The folks in processing are having a tough enough time getting everything done in a timely manner. Are you suggesting someone at COMC check our communications like the NSA ? Surely you haven’t thought that brilliant idea out. And you are bent on someone else determining what and when to sell your own property. I believe the owner’s of said cards should have the say so, as much as possible, in how to sell but I realize, also that there are some that need help. But that help comes at a cost to whoever is providing it. My solution is simple and takes pressure off COMC and allows them to allocate personnel to concentrate on processing and not marketing of sellers items. And why bring Moe into this conversation? That was completely unnecessary! Everyone knows that Moe does an excellent job at customer service and is most helpful in promoting COMC in the best light. Fine, Moe is worth 6 bits. Final offer. Very well said. When I discovered COMC, it was clear that it is a site for collectors first. Though I had nothing to go by but gut instinct, I have felt that professional sellers on the site understood this as well, even though the benefits to sellers are huge. I’m a collector first and seller second to buy what I collect so I see things from both sides. The Vault wasn’t exactly a smash but working in technology myself, I often live through betas and I’m willing to live through these formative stages at COMC for which I applaud them. COMC has never failed me and if there happen to be hiccups along the way to realize an even grander vision for collectors, I’m willing to support the effort and the sellers who embrace it. Nothing worse than a seller with a me first, collector second attitude. For me, it’s mutual or not at all. I appreciate your thoughts sir. The past 30 or so years in the “hobby” have been fun for me and if I made a few buck along the way, it was icing. I collected, bought and sold with my children when they were still under my roof. A great time always, except for my daughter when the delivery truck showed up with a bunch of cases to break. My three boys were ok with it being we were and still are a four sport family. But now it’s time to sell, mostly because I don’t want my children to go through the headache of trying to sell a boat load of cards. So what I make now is gravy for my seven grandchildren in the form of birthday and Christmas “stuff”. Hoping to get enough to buy a boat and do a little fishing. Sounds like a great 30 years. I’m calculating my exit strategy too, but still have another good five years or so of focused collecting left. Good luck to you in your fishing plans. hey hey, guys…let’s all try and play nice here. If someone has an issue then they have a right to voice their concerns – and, this is just as valid a forum as any place. You’re paying for a service, you expect to get what you pay for – that’s common sense and that’s how business works. We’re realizing that there are issues with the new processing services and we’re doing what we can to fix them, and I’d like to apologize to those who feel slighted by the way things have changed with the changes in the services. I’d also like to suggest that people re-read the blog and to refresh their memories re: the changes – 2-8 weeks is the Basic processing time frame, and sports that are in season, as well as newer product, will be given a higher priority in processing. Now, Tim is working on modifying the software we use to ensure the cards that should have higher priorities receive those priorities, as well as speeding up the processes, in general. You can still send in a smaller batch of cards for the Basic service, but the minimum fee is still going to be $25. So, sending in 40 cards would be the equivalent of paying 63 cents a card – rather than 25 cents a card, if you send in 100 or more. Your choice. Moe- I just wanted to give you an update. Finally today (Almost 5 weeks) my 96 cards were uploaded. I looked at the cards and 22 of the 96 were BBall and Hockey cards. The rest were mostly Baseball/Football. So whoever said the in season cards were priority is lying to you, and making you tell everyone that’s the case, when clearly from me its not. Just wanted to let you know. Hi, Arodyanksfan, my apologies on the frustrations with this order! This is NOT how the service should work. There have been some glitches with the new system that we’ve been working on and should now be fixed. I will be monitoring this more closely and sending a more detailed communication about the resolution shortly. Thank you for bringing this problem to our attention! I sure hope it is fixed because I just sent in about 1000 cards and the majority are football and baseball. COMC has had the group since Feb 7th and not one card has been processed for me to price and offer for sale. Is COMC trying to do too much at the expense of the customer? I don’t know but I realize it could be very exciting for young folks with a good idea to press things. Hope this is not the case because I want COMC to succeed in a big way. I have recently stumbled across this site as another avenue to sell card..I have plans to send in a couple hundred cards over the next week or so and feel I have been doing my homework on the site, etc. I look forward to a mutually positive relationship and I have got to think anything is better than dealing with Ebay. I generally sell on Sportslots and it has been OK, but I think COMC is going to work out alot better for me. I have been in the hobby for over 30 years setting up at shows, etc. Let me be the first to welcome you Greg. I too have been in the “hobby” for 30 years plus and now it is time to let everything go but still have a bit of fun with some buying. You will find COMC very user friendly and it seems Tim is working hard to make it better. Although with his youth, energy and lofty goals he may get ahead of himself sometimes but nothing serious. And you will find Moe an excellent source for help should you need it. Again welcome and I look forward to doing a little horse trading with you. Ken: Thanks for your reply…I went ahead and sent in the first batch today…approx 600-700 cards….mostly inserts and parallels….looking forward to tracking their progress. Looks like its still yet to be fixed. I have a batch in since Feb 12th So some should have posted today . Its at 20 percent jumped up 5% today. So i’m guessing it will either go up next week or towards the end. Even thouh i sent in a lot of baseball and base is starting now. The other thing I like about this is that it will keep cards being uploaded more frequently to the site. Don’t know if my previous post was removed, I deleted it, or what happened so here goes again. I had some cards uploaded in three weeks time under the basic processing service. Sent in approx 500 cards that arrived Feb. 7th and 164 were loaded this past Friday Feb. 28th. Mostly 2012 and 2013 from all sports. I am very pleased with it. I used to use the 2 week service. Roughly 1/3 of my batch was finished and uploaded in exactly 3 weeks. I think process times will be even faster after the dust settles from the price guide build and it will be nice to have new cards hitting the site more frequent from all accounts. Great Job COMC! Only thing i don’t like on this is your charging .50 more per card if we list a card for $50.00 or more through the basic service .